RMHC programs support families by providing stability and vital resources they need to focus on what's most important - their child. Improving the family's coping and cohesion, and the child's recovery and outcomes. Published research underscores the role that RMHC plays in keeping families close during times of medical crises through its Ronald McDonald House Program. A strong majority of hospital administrators worldwide agreed that Ronald McDonald Houses play a significant and important role for families. Over 90% agreed that Ronald McDonald Houses reduced stress and costs to families. Accommodation needs are a significant stressor for families of critically ill children, particularly when they are traveling far distances. RMHC and the Ronald McDonald House program help alleviate some of this stress. Families attribute their ability to stay together to the Ronald McDonald House program and believe it significantly affects psychological well-being and their child's recovery. Caregivers who stay at a Ronald McDonald House report significantly higher levels of involvement in their child's care and more positive hospital experiences. Accommodations provided by the Ronald McDonald House program enhance pediatric patients' quality of life. Parents who sleep at a Ronald McDonald House enjoy greater sleep quality than those who stay at the pediatric bedside. RMHC helps improve family coping and resiliency during pediatric hospitalization. William and Heather Lally stayed at the Ronald McDonald House of Central Georgia during the snow storm of January of 2011 when their 5 year old son was admitted to PICU and diagnosed with Type 1 Diabetes. Heather writes 'That event turned our lives upside down, and we will never be the same. But the comfort and love we felt from the Ronald McDonald House is something we will never forget. From the safe, comfortable house to the hot meals to the friendly faces, it was a blessing in a time of despair.' Our location within walking distance of the hospital allowed the Lallys to stay together as a family - snowstorm and all. RMHC is recognized as a public charity under Internal Revenue Code section 509(a) and has 501(c)(3) status. Donations to RMHC are deductible. Donors should consult their tax advisor for questions regarding deductibility. 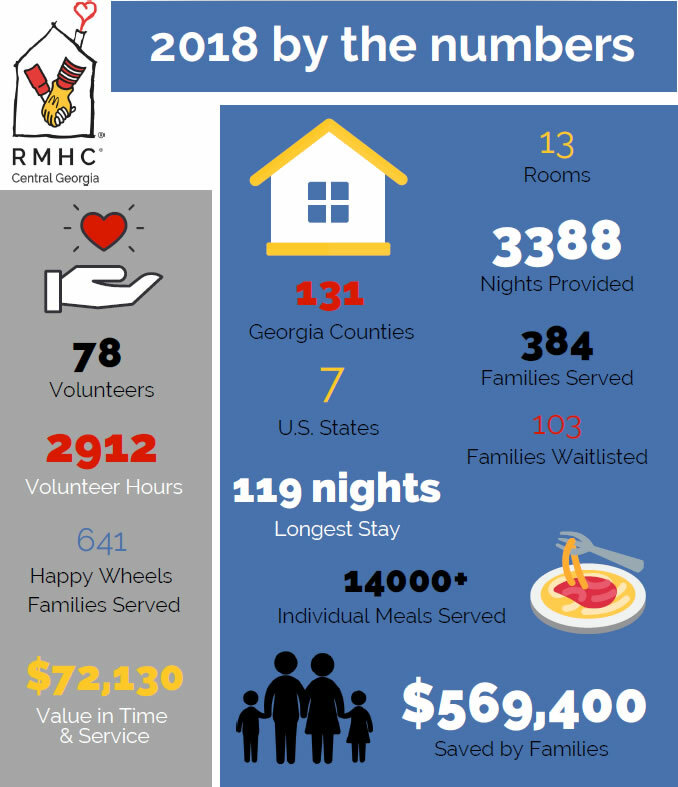 The RMHC EIN is 58-2473799. A copy of the RMHC determination letter is available upon request.